Bob Baffert had the right answer when someone asked him which horse was better, American Pharoah or Dortmund: None. “That’s like asking me which kid I love more,” he said, tactfully and without hesitation. Fair enough. When you train the two leading Kentucky Derby favorites, whether you even think one is better than the other, for obvious reasons, you take the path of least alienation and let the theater of the Triple Crown play out on the race track. That’s the game plan. 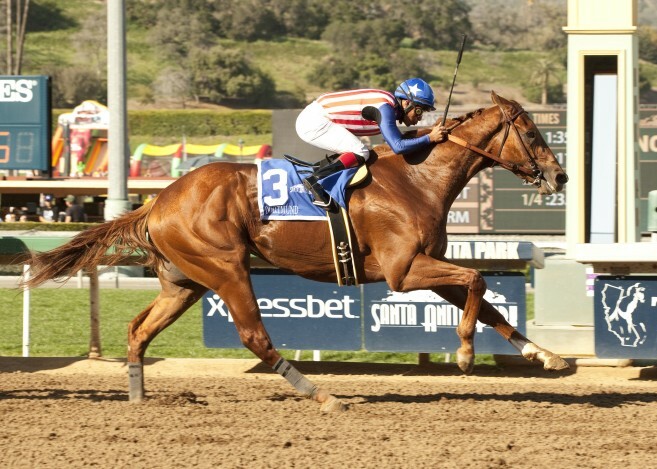 Dortmund, unbeaten in five starts, runs in the Grade I, $1 million Santa Anita Derby on Saturday, April 4, while once-beaten Eclipse Award champion 2-year-old male of 2014 American Pharoah is ticketed for the Arkansas Derby on April 11. Dortmund is an over-sized chestnut son of 2008 Kentucky Derby winner Big Brown, owned by Kaleem Shah. American Pharoah is a bay colt by the Empire Maker stallion Pioneerof the Nile, owned and bred by Ahmed Zayat. 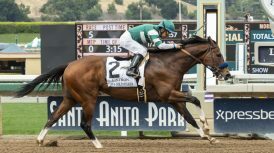 Aside from that, the two immensely talented 3-year-olds are at once comparable and disparate in a manner of speaking that Baffert would address. “Dortmund is tall,” Baffert said. “He’s got a good mind on him; he’s a smart horse. He gets a little rambunctious in the paddock, but other than that, he’s pretty good. “They’re really two different types of horses, although they’re both quick, they’re light on their feet. I’ve seen Dortmund stumble and break a little awkward but he can get up in the next jump and be right there. He’s really quick and very athletic, for a big horse. Big horses aren’t that way, usually. I’ve worked him in the mornings; you can stop and go with him. 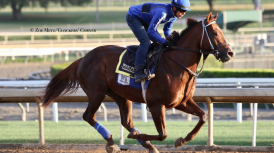 “Pharoah has a very efficient, kind of effortless stride. He does things really, really easy. I think he can handle any surface, whether it’s deep, fast, whatever. He’s fast, but he’s not a speed-crazy type. “The reason they find themselves on the lead is because they do it effortlessly. You’d have to really slow them down, get them down to a gallop, to have them stalking a horse. I don’t know what would happen if there was some ridiculous speed out there. If all goes well, the twain will meet in the Kentucky Derby the first Saturday in May. Dortmund worked six furlongs in company Saturday morning at Santa Anita in 1:12 with regular rider Martin Garcia aboard. Baffert said the colt “went nice.” Stablemate Miss Midnight Brew was given a five furlong time of 1:02.60. San Felipe runner-up Prospect Park worked six furlongs at his San Luis Rey Downs headquarters in 1:10.40 under jockey Joe Steiner. 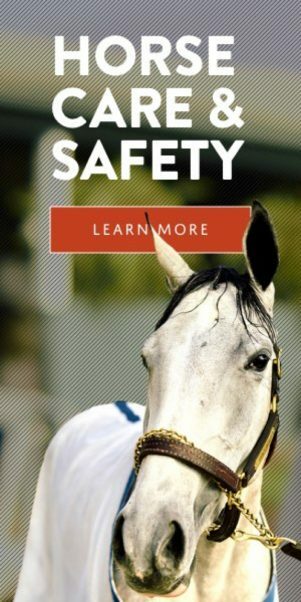 Trainer Cliff Sise Jr. called the drill “unbelievable,” adding that the son of Tapit would ship to Santa Anita “Monday or Tuesday” and have a five furlong breeze before the race. Jerry Hollendorfer said that El Camino Real Derby runner-up Cross the Line was “possible” for the Santa Anita Derby. 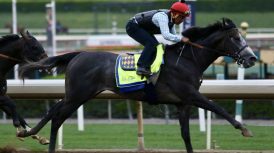 Baffert didn’t rule out One Lucky Dane for the Santa Anita Derby after his win by nearly 10 lengths in a one-mile overnight race Thursday. 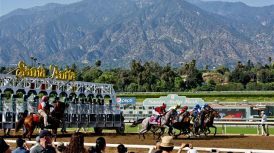 Santa Anita offers a $750,000 guaranteed Late Pick 4 pool and a $300,000 guaranteed Pick 6 pool on Santa Anita Derby Day. FINISH LINES: Santa Ysabel Stakes winner Stellar Wind, working for the Grade I Santa Anita Oaks on April 4, went five furlongs Saturday in 1:00.80. “Beautiful; first class,” said trainer John Sadler, giving the ‘OK’ sign to boot . . . Also working for the Oaks were China Doll runner-up Curlin’s Fox for Carla Gaines (four furlongs in 47.80) and Santa Ysabel third-place finisher Glory for Jerry Hollendorfer (five furlongs in 1:04) . . . 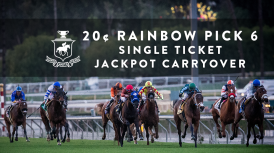 There were two winning Pick 6 tickets yesterday worth $87,892.20, one purchased at Santa Anita on a $2,400 ticket, the other in Las Vegas for an as-yet unknown amount . . . Decisive Edge makes his stakes debut in next Saturday’s 1 ½-mile Tokyo City Cup for Hollendorfer. Alex Solis rides . . . Imperative, set to defend his title in the April 18 Charles Town Classic, worked four furlongs for George Papaprodromou in 49.20 . . . Edwin Maldonado leaves Monday morning for Dubai, where he rides front-running Distinctiv Passion for trainer Jeff Bonde in the $1 million Al Quoz at 1,000 meters on turf, approximately five furlongs . . .Bruno Panicucci, a 19-year-old apprentice rider from France with four wins, is scheduled to make his Santa Anita debut next Saturday for trainer Leonard Powell. Panicucci tacks 109 pounds . 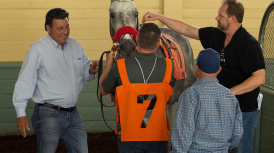 . . Former USC place kicker “Sad Sam” Tsagalakis, father of trainer Mark, who sent out Oliver’s Tale to win Friday’s seventh and feature race: “It’s so nice to be out here for Mark. It’s not the Kentucky Derby, it’s not the Preakness, but it is Santa Anita. One of these days he’ll get lucky and we’ll have a big horse running. I’ve been coming here since I worked as an usher when I was going to USC in 1952, 53, 54. I did the kicking for the football team and went to two Rose Bowls . . . All my friends say, ‘One kick and you think you’re the greatest.’ I said, ‘I am the greatest.’ That was before soccer kickers.” . . . 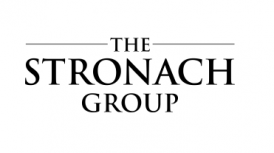 This past October, the third annual John Morris Golf Classic was held in Lexington, Ky., benefiting worthy charities that support those with disabilities. After today’s first race, Morris presented a $5,000 donation from the event to Aaron Gryder, Tyler Baze and Joe Talamo, who accepted on behalf of the Permanently Disabled Jockeys’ Fund . . . Next Saturday, March 28, features the Grade III Tokyo City Cup on Japan Family Day, with the Ramen Yokocho Festival in the infield. For more details, visit www.tokyocitycup.com.